It has been three days since I installed the new package bees in their hives. Now is the time to check and see if the queens have been released. I light the smoker first, though newly installed bees from packages are normally pretty docile. It is my policy to go ahead and light the smoker before opening hives, so as to prevent having to go back and light it after discovering that the bees are agitated. First I check hive #2, this is the hive in which I installed the queen that was alive. (While installing the package in hive #1, I discovered a problem – see post #2.) The queen cage in hive#2 is empty, so she is out. I make no attempt to look for the queen. I remove the empty queen cage, push the frames back together and close the hive back up. I’ll leave them alone until Sunday, which will be one week after installation. Now I proceed to hive #1. You might wonder why I am checking a hive where I know that the queen is dead.The reason is that I have a suspicion that I may know why she died. I open the hive, ignore the dead queen in her cage, and start to look through the frames. First I notice that there seem to be more bees in hive #1 than in hive#2, which is interesting. With a dead queen in hive #1, I was actually concerned that the opposite might be the case – that some of the bees in hive #1 might leave, due to the lack of pheromones from a live queen. I remove some frames from the hive, see several frames of already drawn comb and, in a couple of the frames, eggs! Eggs! They look like amall, vertical grains of rice. Click on photo to enlarge image and see the eggs more easily. 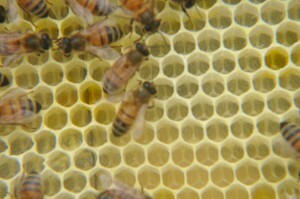 Eggs mean that there is a queen in this hive, but the queen in the cage is dead. What is going on? 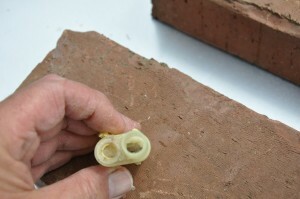 The solution is in the procedure used to make up packages of bees. The bees are shaken from strong hives. Before the shaking, the queen is found and removed, so that she does not inadvertently end up in the package. But hives can sometimes contain multiple queens (not unusual in the spring when bees are swarming), and occasionally a queen is accidentally shaken into the packages with the bees. When this happens, the package contains two queens, one loose in the package and one in the queen cage. In this situation, the bees will most likely accept the loose queen as “their queen” and ignore, or not feed the one in the cage. I’m certain that was the case with the package in hive #1. I make no attempt to find the queen; the eggs tell me she is present. I replace the frames and close the hive. As I mentioned in the last post, one of the difficult tasks for new beekeepers is learning from experience that bees don’t always do what the book says they will do. Many years ago, while still a novice beekeeper, I bought my first package of bees. I installed them per the instructions, waited three or four days and checked on the queen. I discovered that the bees were making zero progress in freeing the queen. Wondering what was going on, I called my friend and mentor Larry “Bee” Blandford and asked him. Without hesitation, Larry responded “go through the hive and look at the frames for eggs”. “Sometimes a queen ends up loose in the package and the bees won’t try to free the one in the cage. They’ll have little interest in her, because they already have a queen.” Sure enough, that day I found eggs, along with a queen, in the hive. Since that time, I have passed on Larry’s advice to other beekeepers who were puzzled by the same situation. It was that experience that prompted me to look for eggs in hive #1. So things are good in the hives. The queens are out of their cages (though the first was never one), but now it appears that hive #1 is ahead of hive #2. I’ll deal with that issue later. On Sunday I’ll give both of these hives a complete evaluation. Today, I’m happy to know the queens are out. 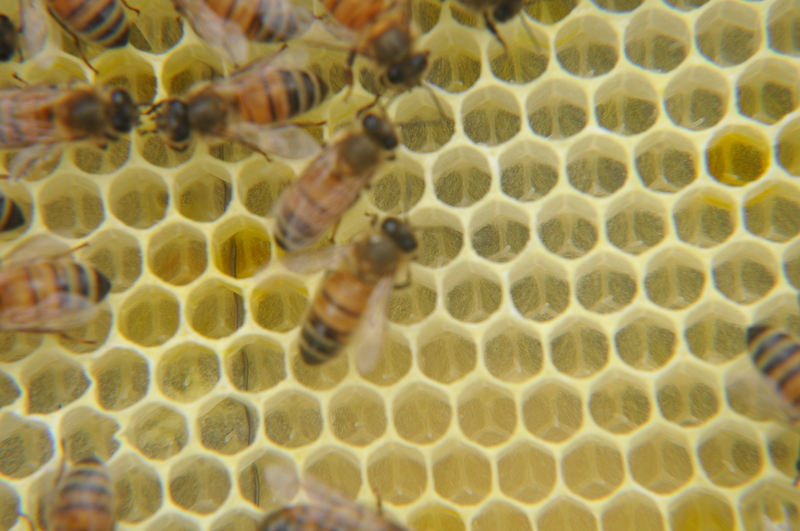 A special thanks to Jim Coss of The Honey & Bee Connection, who provided the package bees and hives for this series of posts!